All donated bikes must be in good working order. Minor wear is OK, but we reserve the right to turn away any bike with major damage or wear. In addition to bikes, we are collecting toys for kids up to age 13. So spread the love, it’s the Brooklyn way! To get 10% off a new kid’s bike, you must purchase it on the same day as you donate the old one. Click here to browse our selection of new kid’s bicycles, tricycles, and balance bikes. Get 10% off a new kid’s bike when you donate a used kid’s bike to our Holiday Toy Drive. 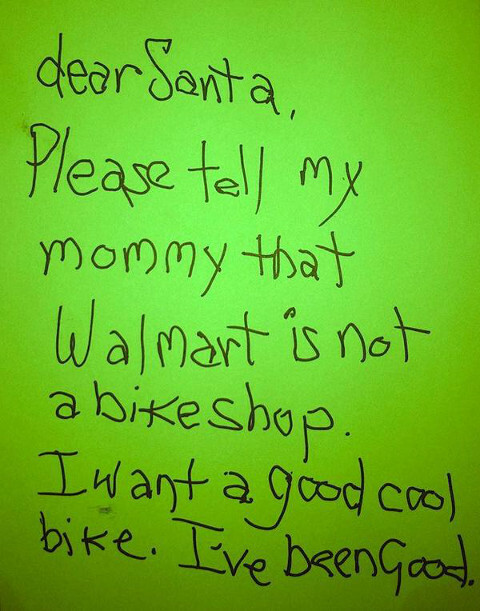 And since we’re talking about kids getting bikes for Christmas, this is a good time to repost a Letter to Santa that made the rounds on Twitter a couple of years ago. It’s more true now than it has ever been. You can’t get a real bike at Walmart, K-Mart, Target, Toys-R-Us, or on Amazon. Bicycle stores like ours sell kid’s bikes that are lightweight, well-designed, and well-made. That means they are easy to ride and they last for a long time with very little maintenance. Department stores and mass market retailers sell kid’s bikes that are heavy, poorly designed, and poorly made. They are difficult to ride at best, and they frequently break altogether. Any difference in the initial purchase price is quickly made up in extra maintenance for the department store bikes. So what’s the point? When you buy a kid’s bike from Bicycle Roots, you are sure to get a high quality bicycle your child will love. Our staff truly knows and loves bicycles, so we can help you find the right model and size for your child. We can even show you how to teach your child how to ride a bike! And since we’re really trying to make things easy for Santa, we offer free holiday storage for your purchases. When you purchase a bike from us, we can hold it for you at the store right up until Christmas Eve. Bicycle Roots is an independently owned and operated bicycle store serving residents of Crown Heights, Prospect Heights, Bedford-Stuyvesant, and Flatbush in Brooklyn, New York. We sell high quality bicycles, tricycles, and balance bicycles for kids of all ages, as well as fun and useful kid’s cycling accessories like training wheels, bells, helmets, and elbow and knee pads. Stop by our store at 609 Nostrand Avenue or shop online at www.bicycleroots.com.